Lets play a word association game: When we give you the word you say the first thing that comes to mind. Are you ready? Here it goes: Futuremark. We bet you said “3D Mark” or maybe “benchmarking”? Either way we generally associate Futuremark with its awesome benchmarking tools that PC enthusiasts love to play around with. Taking their knowledge of real-time game engines from their use in 3D Mark, Futuremark is breaking new ground by making a playable videogame. Shattered Horizon is that game and it’s one helluva of a zero-gravity multiplayer shooter, however not without its flaws. In true Futuremark fashion, Shattered Horizon is a solid depiction of top of line real-time 3D rendering techniques. The visuals are sharp and beautiful and depending on your system’s specs it may bring your machine to its knees. It’s not necessarily on the same level graphically as a game like Crysis but we’re chalking that up to inexperience in design and not a shortcoming of the rendering back-end. Even with that said, Shattered Horizon is a beautiful game and swirling around space with the gorgeous blue Earth as the backdrop is remarkable. Fortunately the game is very scalable so those with older systems will be able to easily drop some of the settings down to get a playable frame rate and enjoy the zero-gravity madness. 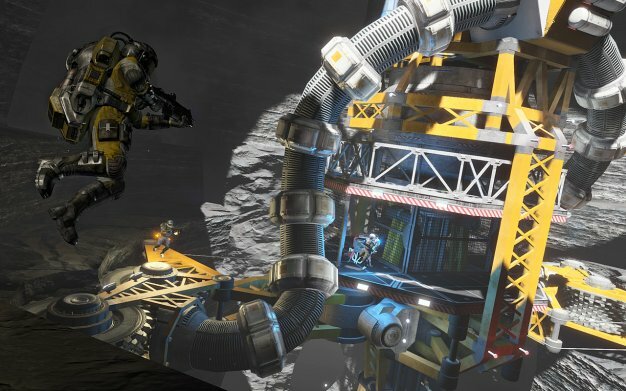 The gameplay is like any other first-person shooter except that enemies can come at you from every possible direction while you’re floating around chunks of the disembodied Moon that’s orbiting Earth. This zero-gravity aspect and 360 degree range are the most challenging aspects of the game and gives Shattered Horizon its charm. Establishing your bearings can very difficult among the hail of bullets and EMP grenades which makes disorientation a common occurrence. Even though it can be very frustrating at times trying to maneuver around while aiming and shooting, seeing others being successful makes you want to learn that much more. The game modes are pretty standard: control points on a map, capture the flag, etc. The innovation comes from the extra element of zero-gravity and the ability to be attacked from all angles. No spot is safe, ever. The learning curve however is noticeably steep. It can take hours and hours of gameplay just to master moving around maps, quickly changing orientation, sticking to objects, properly using your booster all the while teaching your brain to not get directionally disoriented. Then after you master that you get the pleasure of doing all of that while aiming and shooting at other players. You may find yourself not being able to adequately defend yourself against players who have already learned the tricks and ending each round with zero kills and many deaths. Unfortunately there doesn’t seem to be a practice or bot mode where you can run around with stupid AI and get your feet wet and instead you’re thrown to the wolves to get your rear-end handed to you over and over again. The lack of a practice mode might cause some headaches to beginners. The visual direction of the game is pretty bland and generic, there is no real sense of style or identity to the game. 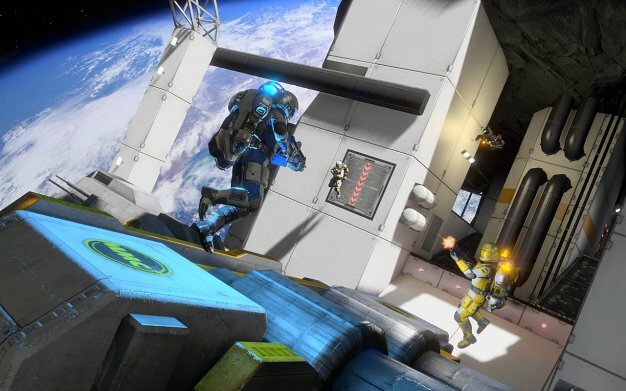 The character models look like slightly futuristic versions of the NASA space suit and the maps are made up of generic space station objects and generic looking Moon rocks. Fortunately for Shattered Horizon most of the game’s appeals comes from the unique gameplay mechanics rather than it being visually interesting. If Futurmark could have tied the visual direction in a bit more with the chaotic gameplay then Shattered Horizon would have been a much more complete package. Sadly that visual fingerprint isn’t there and the game ends up being very lopsided in regards to visual design. The potential is there as the engine and rendering technology appears to be top notch, it was just implemented in a bland and generic way. The most important aspect of any game is whether or not it’s fun which begs the questions: Is Shattered Horizon fun? After you climb the steep hill that is the learning curve the game does end up being fun while maintaining a high level of difficulty. 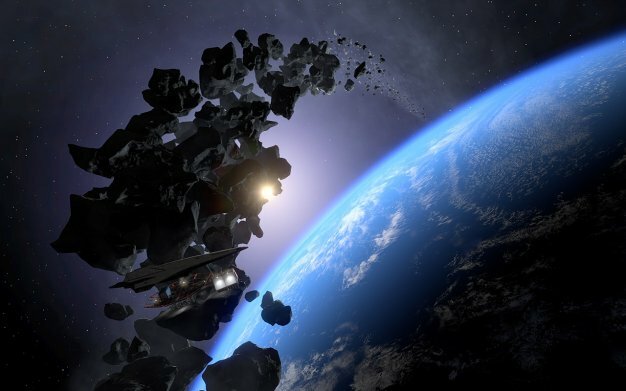 If you can muster the strength to take constant abuse until your reflexes and senses are tuned to zero-gravity space combat then Shattered Horizon will be a fun game for you. Since the game is multiplayer only it lacks in the ways of visual direction and story. Fortunately it doesn’t detract all that much from the core game but would have made for a much more complete package. We think for Futuremark’s first time out at sea as a videogame developer has been pretty successful. Will Shattered Horizon replace multiplayer standards like Team Fortress 2, Halo or Counter Strike? Most likely it won’t for most, but for those looking for a different environment to get their frag on, Shattered Horizon offers a fantastic alternative to the traditional multiplayer shooter.